Peace Walk in Ogden Park – Saturday, April 5th! | R.A.G.E. 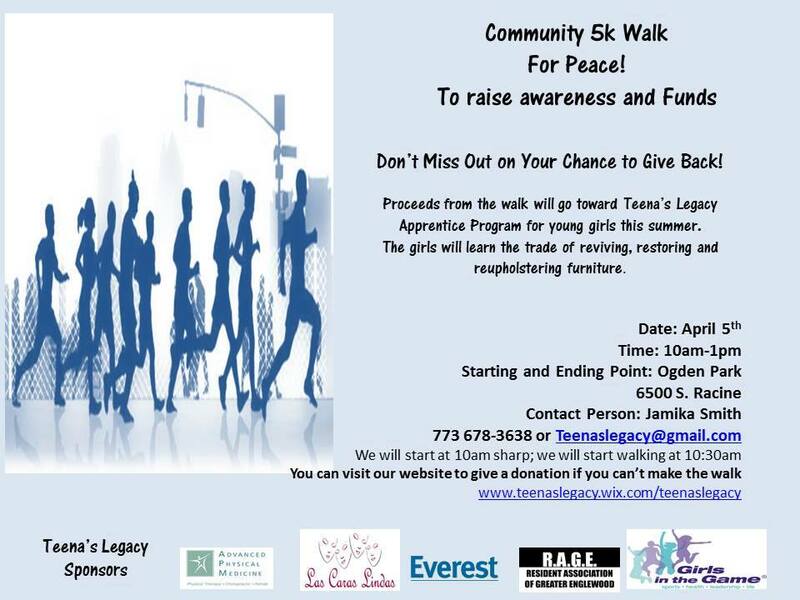 Peace Walk in Ogden Park – Saturday, April 5th! Join others for a community peace walk to benefit Teena’s Legacy, Saturday, April 5th at 10am in Ogden Park -6500 S. Racine! I am unable to attend the walk on Saturday due to another engagement but, I would like to talk with someone about joining and attending a meeting with Rage. My name is Victoria Waller and I can be reached at 773-905-8227. I saw a program on channel 19 in which Rage was featured and would like to find out more about your organization and the things that I can be apart of in helping our neighborhood. I would like to talk with someone in regards to becoming a member, Thank you and I look forward to talking with someone soon. The Englewood Back to School Parade is baaaaack!